For Ambedkar, the route to a modern and just labour structure in India was simple- the destruction of the caste system, which he believed was rooted in the basic tenets of Hinduism. “Turn any direction you like, caste is the monster that crosses your path. 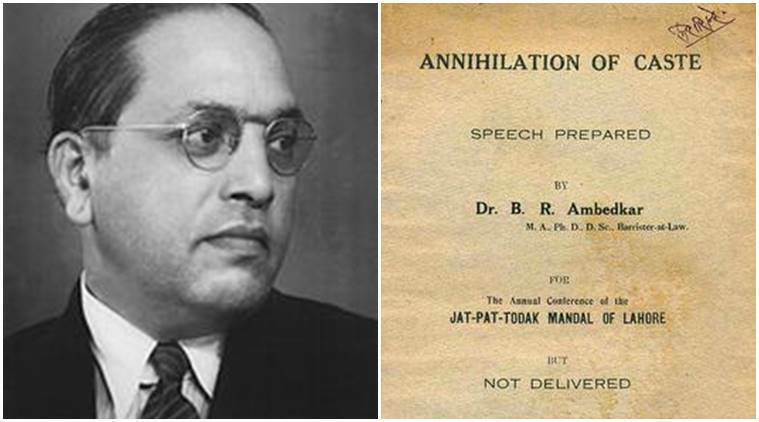 You cannot have political reform, you cannot have economic reform, unless you kill the monster,” wrote B R Ambedkar in his celebrated work, “The annihilation of caste.” For Ambedkar, the route to a modern and just labour structure in India was simple- the destruction of the caste system, which he believed was rooted in the basic tenets of Hinduism. Arguing against the divisions of the caste system, Ambedkar as a social and political reformer, brought about great changes in the workers’ lives in India. The reforms brought about in terms of reduction in working hours, improvement in working conditions, particularly that of women and the downtrodden segments of society, promotion of trade unions and labour rights; all owe their development to Baba Saheb. However, Ambedkar’s philosophy of labour reform went beyond the tenets of socialism that were observed in several European countries. For him, empowerment of labourers in India could not be brought about without addressing the real problem of caste system. On the occasion of May Day, as we celebrate the rights and struggles of workers across the globe, it might be useful to reflect upon the doctrine of Ambedkar that established a modern labour structure in India. “I would like to ask the Socialists is this: Can you have economic reform without first bringing about a reform of the social order?” asked Ambedkar in his work. As per him, even if going by the basic socialist principle, workers were to lead a revolution in India for the sake of their rights, they would hardly lead a free life in a society that is ranked according to castes. Such a ranking of course, is predestined and has nothing to do with abilities of the individual. In this social arrangement, workers would continue to be subject to tyranny and suppression despite revolution. Hitting out against those, including Mahatma Gandhi who propounded the caste system on grounds of division of labour, Ambedkar wrote that the caste system was “not merely division of labour, but also a division of labourers” rooted in a belief that had the sanction of the shastras. The predestined division of labour based inherent in the caste system and Hinduism stalls, mobility of labour and capital, thereby harming economic development. Since a person is believed to be destined to do a certain kind of work, he or she is immediately discouraged to engage in any other kind of labour, even if the individual possesses the requisite skills. Similarly, a worker is motivated to invest capital only in the kind of work that is allocated to him or her by virtue of his caste. The inefficiency in resource utilisation that such a structure gave rise to, according to Ambedkar, was the direct cause of unemployment in India. It is the caste system therefore, that needs to erased, in order to bring about workers’ liberation.